Centrepiece of countless holiday photos, Muckross House is the perfect Victorian mansion. This creeper-festooned stately home rises from lush gardens, with one of the Lakes of Killarney (Muckross Lake or the Middle Lake) as its garden pond. It lies within walking distance of Killarney’s Holiday Village (3.6km via a car-free path) in the heart of Killarney National Park, on a small peninsula between Muckross Lake and Lough Leane. You can take a guided tour of the house and venture back to the 19th century. The elegantly furnished rooms demonstrate the lives of the landed gentry in the mid-1800s, whereas the basic accommodation of the basement shows the reality of life for the servants. There is also a craft centre with artisan workshops, and a great cafe/restaurant. Lawyer, politician, and campaigner for Catholic emancipation in the 19th century, Daniel O’Connell lived in the imposing Derrynane House, near Caherdaniel. Set among 120 hectares of parkland next to the beautiful beach at Derrynane, the house is a display case for many historical artefacts and items from O’Connell’s life and career. It is located 3.5km from Caherdaniel (off the N70 or Ring of a Kerry road), with guided tours available for €5 per adult, €3 per chlld/student, and €13 per family. A relatively recent edition to Derrynane House is the coach house, built in 1992 to accommodate the chariot built to carry O’Connell on his triumphal parade through Dublin on his release from prison in 1844. This meticulously stored wonder is richly upholstered and gilded and features twin elaborately carved thrones. Dating from the 15th century, the two large, imposing square towers of Listowel Castle stand guard over the River Feale on an elevated site in the town. A significant portion of the castle still stands, and substantial conservation work has restored the twin, square towers of 15.3 metres in height connected by a wall and an archway. Access is by guided tour only. Back home we go for a trip to Killarney House. The subject of a substantial restoration project, Killarney House is gradually opening to the public, and you can now enjoy a free tour of three fully furnished rooms in the house, as well as the magnificent French-style gardens. The reception rooms are furnished as they were during the time of the last owners, Irish-American property magnates the McShains, who left the house and estate to the Irish state on the death of Mrs. McShain in 1998. 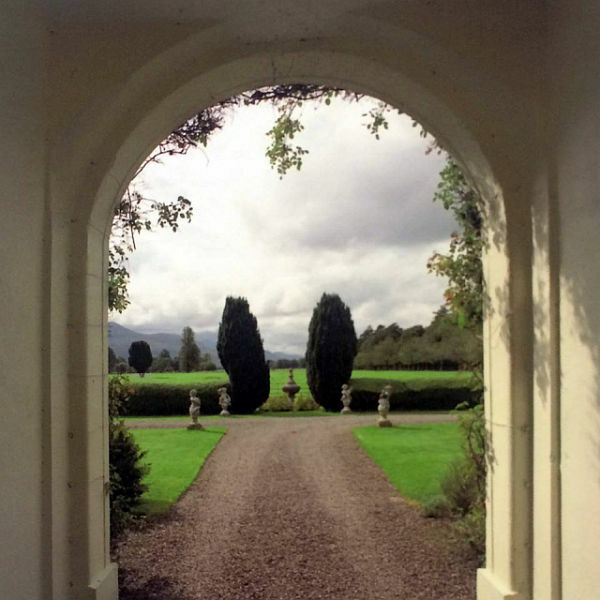 Killarney House is actually the extensively renovated stables of what was then called Kenmare House. If all stables were like this, however, I think we’d all want to be horses!